If you’re looking to get away from the city blues and stay in a village experiencing true tribal living, Desia Koraput should be your stop. What makes Desia Koraput camp so special is the importance that is given to the rich tribal culture of the people who live here by promoting their festivals, dance and music, cuisine and rituals, and showcasing them inside the property. You will love Desia’s use of local materials in the cottages which have been built by the locals. 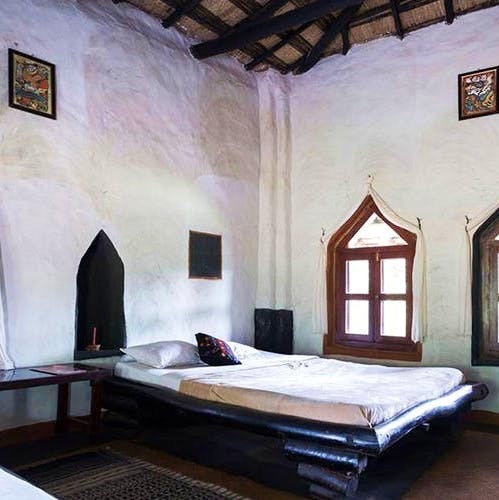 The cottages are equipped with modern comforts, small things like utensils are used to decorated the spaces and earthly colours are used on white walls. The bathroom walls are decorated with shells. Some of the artwork has been done by artists brought from Shantiniketan. If you want your money to go towards local tribes, then this is the place. A part of the profits is used to preserve the region as they believe in eco tourism. So when you pay for your stay, you’ll know you’re spending it for some good. Located in the isolated valley of Koraput, Odisha, it is a community-based rural tourism initiative run by the people of Bantlabiri village, Heritage Tours and an NGO, Barefoot. This camp has enough events to keep the tourists busy – you can go on a tour of the village and interact with local tribals, or visit the the haat which sits on Thursdays, Fridays and Saturdays, trek up nearby hills, walk to the Duduma waterfall between Odisha and Andhra Pradesh and visit the spectacular tribal market of Onkadeli where you can pick up local produce, handmade pottery, decor and accessories that the tribals make. Visit the weekly market of bison horn Muria tribes and their interesting villages. Or the tribal museum which is a treasure of tribal antiquities. When you just want to chill, you can also sit out on the long verandahs with clay flooring to enjoy your evening chai. The room tariffs are INR 3,500 for normal rooms, and INR 4,500 for deluxe rooms, with breakfast and dinner. Except for BSNL, no network is available here. So make sure you come with the agenda of isolating yourself and indulging in some real peace and calm. They have several excellent packages tailored towards different preferences like adventure tours, trekking packages, nature tours etc. Check out their website for more info.